President Obama speaking at Living History Farms. President Obama spoke to about 10,000 people early this afternoon at Living History Farms in the Des Moines suburb of Urbandale. Obama, who has said he did not watch this past week’s Republican National Convention, nonetheless offered a critique of what Mitt Romney and Paul Ryan said in Tampa. President Obama speaks at Living History Farms. “What they offered over those three days was more often than not an agenda that was better suited for the last century,” Obama said. Obama suggested little substance had been revealed at the GOP affair. “There was a lot of talk about ‘hard truths’ and ‘bold choices’ but nobody ever actually bothered to tell you what they were,” Obama said, laughing along with the crowd. But when the crowd started booing when Obama first mentioned the Republican convention, Obama shot back. “Don’t boo,” Obama said. “Vote!” The crowd cheered. 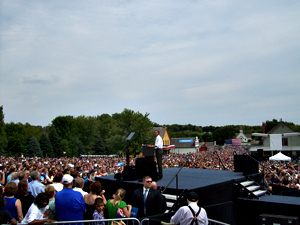 Obama and his campaign apparatus in Iowa are focused on “early voting” which starts at the end of this month in Iowa. Obama campaign staffer Kevin Patrick spoke to the crowd about an hour before the president, asking for people to raise their hands if they were registered voters. 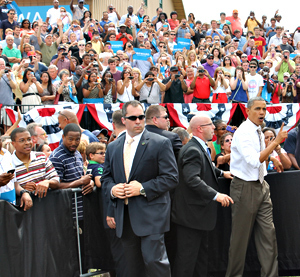 Patrick directed people in the crowd to Obama campaign staff roaming around with clipboards. 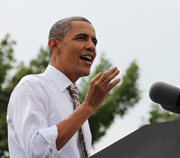 Obama is due to speak at Morningside College in Sioux City this evening. While Obama attacked Romney for a lack of substance, Romney campaign spokesman Shawn McCoy said Obama had “offered no new solutions, just misleading attacks” this afternoon.